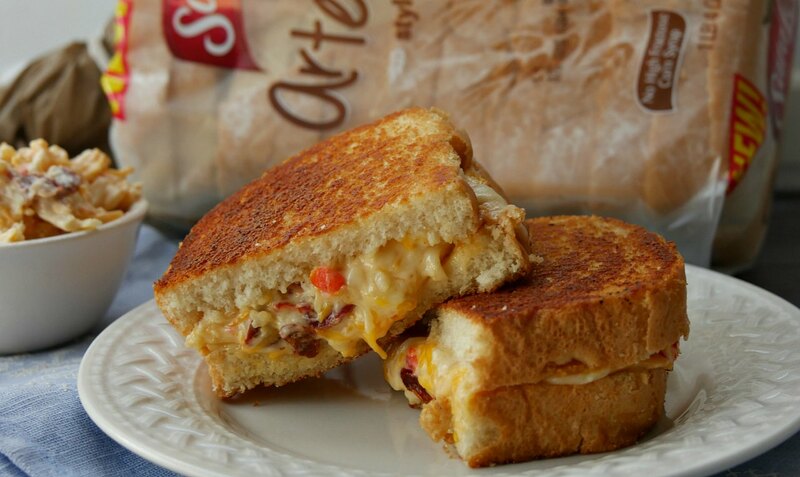 Celebrate National Grilled Cheese Sandwich Month with a gourmet grilled cheese recipe made with Chipotle and bacon pimento cheese sandwiched between two grilled slices of our sponsor Sara Lee®'s Artesano™ Bread. A grilled cheese sandwich is a favorite comfort food for many people and April is National Grilled Cheese Sandwich Month. 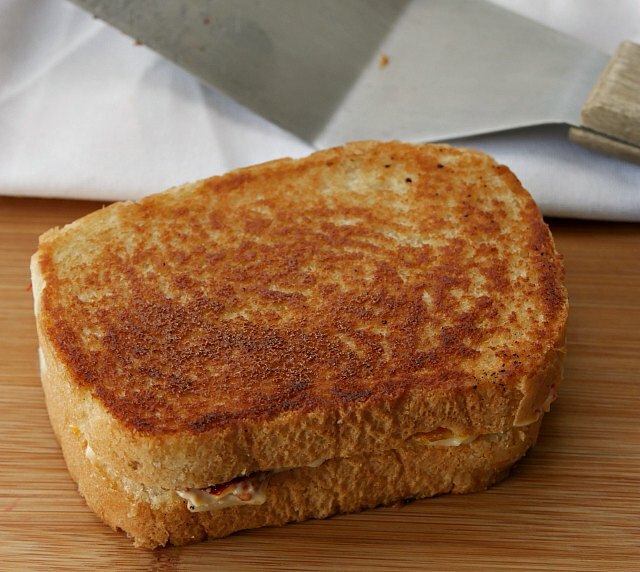 It's a great excuse to make a gourmet grilled cheese sandwich recipe. The two most important parts of a truly delicious grilled cheese sandwich are the bread and the cheese and I have the best of both in this grilled cheese sandwich recipe. Sara Lee® Artesano™ Bread makes the best grilled cheese sandwiches. The bread is free of artificial flavors, colors and high fructose corn syrup. 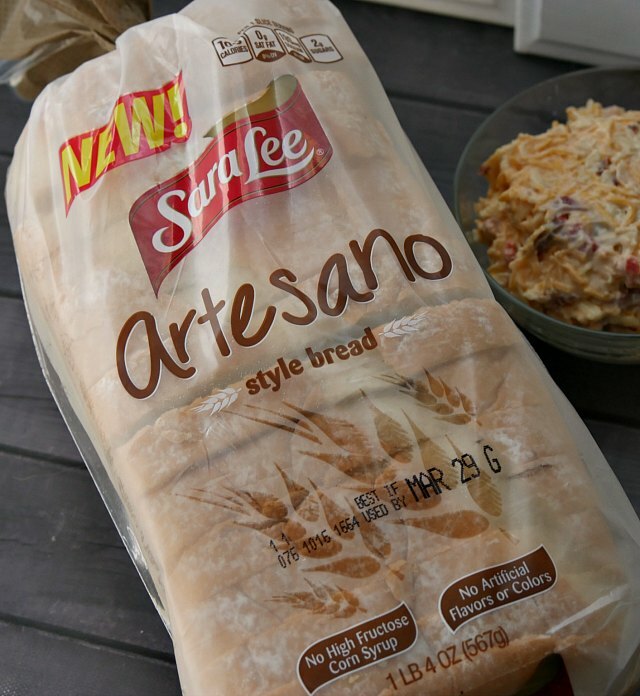 Sara Lee® Artesano™ Bread is nice and soft like homemade bread, but it's found in the grocery bread aisle of Walmart and most local grocery stores. Grab a loaf or two for an entire month of grilled cheese sandwich making. For the perfect bread, you also need the perfect cheese. I used my favorite pimento cheese recipe with spicy Chipotle peppers and salty bacon to create an unbelievable grilled cheese sandwich. Just slather the pimento cheese between two slices of Sara Lee® Artesano™ Bread and fry in a little butter. 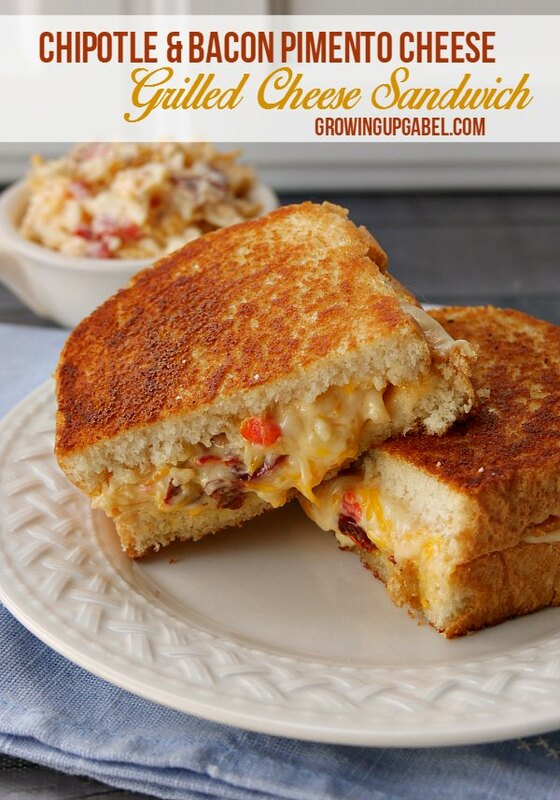 Grill until both sides of the bread are a rich, golden brown and the pimento cheese is warm and oozing from the sides of the bread. 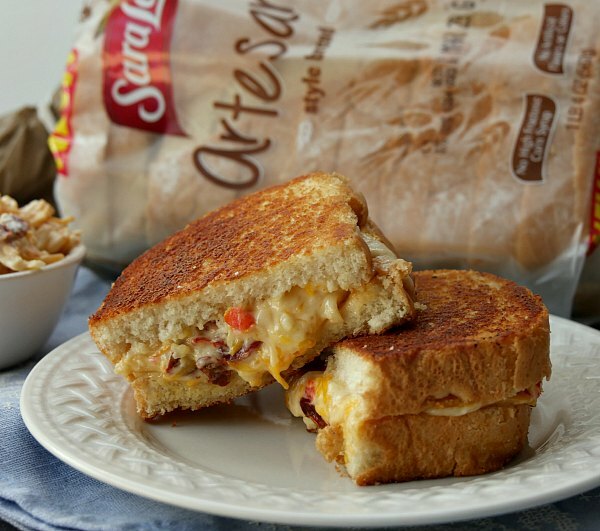 Sara Lee® Artesano™ Bread is strong and hearty enough to stay together even with a lot of gooey warm pimento cheese spread. Look at that gorgeous crust! Slice the sandwich and serve immediately while the cheese is still warm! Heat griddle or frying pan over medium heat. Place one slice of bread, butter side down, in the pan. Scoop pimento cheese spread on to the bread and place second slice of bread, butter side up on top of the cheese. Grill until both slices of bread are toasted and cheese is warm and oozing. Serve immediately. 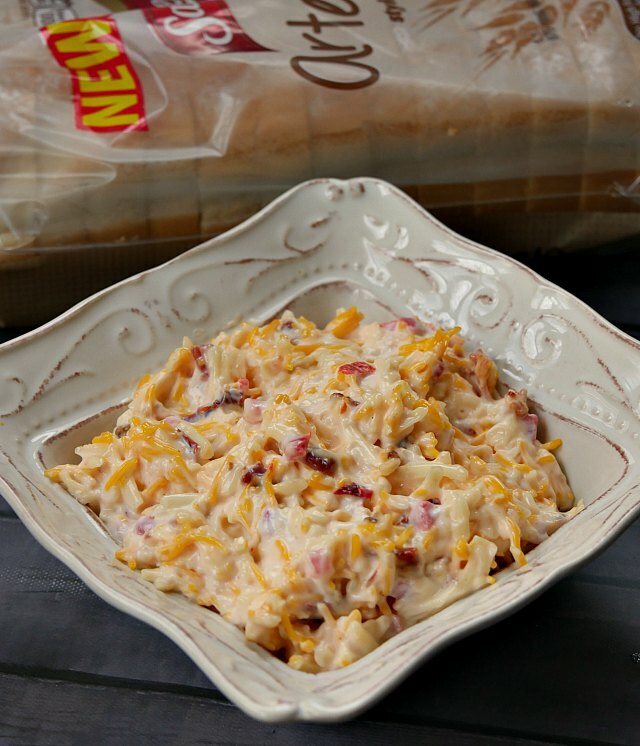 I’ve been thinking about making chipotle pimento cheese lately! Now I’m going to stop thinking about it and do it! Looks yummy! Welcome to the SRC and what a great first post as your sandwich is just gorgeous, I want a bite right now. Whao, these sound awesome. I’ve been meaning to to make Pimento cheese spread but wasn’t sure what to do with it. A grilled cheese sandwich! I’m so there! My first time to join SRC and I’m enjoying the blog hopping. That sandwich looks like a keeper! Welcome to the group! I hope you have as much fun as we do month after month. That sounds like an awesome sandwich. That is one SERIOUS grilled cheese sandwich. It looks absolutely amazing. Yum yum yum yum! Those look great. Glad they worked for you! Laura, you have changed my life forever with these! 🙂 Thanks for the AWESOME recipe!! oh my goodness – this sounds amazing! Welome to SRC! This looks fantastic! I totally am putting this on my list to try! Thanks!